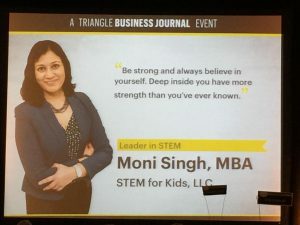 Durham NC, 03/30/15 – STEM For Kids’ Founder and CEO, Moni Singh received Triangle Business Journal’s prestigious Women in Business Award. The Women in Business Awards program recognizes women who have proven to be dynamic and outstanding leaders with established track records of significant accomplishments in business and/or community service. Singh was recognized as a Leader in STEM during the Awards Luncheon at the Sheraton Imperial Hotel. Prior to the Awards ceremony, Singh provided one-on-one coaching to several women participating in the Bizwomen Mentoring Monday. The second annual mentoring event was part of a larger effort that took place in 40 markets across the country on the same day. The event offered attendees in each market the opportunity to choose from 40 on-site mentors, who are the most influential women in the community.